Imagine you’re an owner of a restaurant trying to run a successful business, but you don’t know how much inventory you have, or when distributors will arrive to replenish your resources. Or imagine that you own a grocery store, but there isn’t any rhyme or reason to the times you’re allowed to have your store open. Or a factory, but your production fluctuates wildly from day to day. Now, imagine trying to manage a wild fishery under similar circumstance - with no understanding of how many fish should be allowed to survive and spawn and no idea how many fish have made it up river to do as much - sounds like quite a challenge, right? 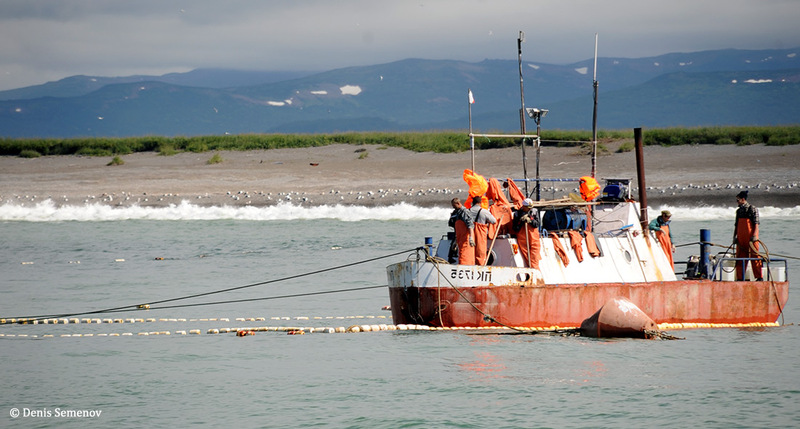 Prior to a scientific report released this past spring by the regional fishery agency KamchatNIRO, a remote fishery in northeast Kamchatka, home to 50% of Kamchatka’s pink salmon harvest, was managed under similar circumstances. In Karaginsky Bay, there were no goals for how many salmon should be allowed to escape up each river to spawn, no system in place to monitor escapement during the fishing season, and a management system which based fishery openings and closures on pre-determined time schedules instead of monitoring data. The hope was enough salmon were getting upriver to spawn, but there was no way to know for sure until the season was over. So what did this new report do, and why the big deal? It established, for the first time, science-based salmon escapement goals and an escapement monitoring plan for Karaginsky Bay. This important step will change the fishery management strategy from a reactive ‘take action if there is a catastrophe’ approach to a proactive ‘let’s ensure enough salmon are spawning to sustain future generations’ approach. Salmon escapement goals are the pillar of sustainable salmon management and are commonly used in Alaska, Canada, and other parts of Russia. Fishery managers monitor escapement during the fishing season to manage the fishery in a way that ensures enough salmon spawn to sustain strong populations that can support commercial fishing and healthy ecosystems year after year. Depending on escapement levels, fishery managers control harvests by temporarily opening and closing areas and times to fishing to allow sufficient numbers of salmon to escape and spawn. This year’s adoption of escapement goals and in-season monitoring is a huge win for fish and the seafood community, but the road to sustainability is a long one for Karaginsky Bay and many other global fisheries. KamchatNIRO will need continued support from fishermen, NGOs, and the local community to see through these important commitments and ensure the tools needed to actively manage the fishery are in place. Funding and capacity to do this work remains a challenge in this remote region of Russia, therefore increased engagement from the private sector is a must. We’re working to establish a formal fishery improvement project with Karaginsky Bay producers to ensure escapement monitoring is implemented effectively and to keep Kamchatka’s pristine wilderness producing fish, seafood, and livelihoods for generations to come.